Many of our neighborhoods in District 6 and across the city have celebrated National Night Out with their neighbors for multiple years now, but some are hosting their very first events this week. I applaud you all for helping to make your neighborhoods safer! If you missed hosting a block party for National Night Out, I was able to secure free block party permits through our budget process for the entire year (July 1, 2018 through June 30, 2019). To apply for a free street closure permit go to: https://www.sjpd.org/PDF_Forms/BlkPartyInst-App.pdf. National Night Out has become one of the best annual reminders that connected communities are safer communities. The event not only sends a message to criminals, who might otherwise consider a neighborhood vulnerable for burglarizing, but also strengthens the resiliency of a neighborhood and a city in the event of an emergency. Congratulations to all the neighborhoods who held an event. We enjoyed visiting and meeting new neighbors! Join us to celebrate the opening of Three Creeks Trail on Saturday, August 25th at 9:00 AM. Join your friends and family for a jazz concert in the Municipal Rose Garden on August 25th at 5:00 PM! Join your friends and family for a movie night at the Municipal Rose Garden. We will be showing Despicable Me 3 on September 1st at 8:00 PM. Shasta / Hanchett Park Neighborhood Association, in conjunction with the Alameda Business Association, proudly presents the eighth annual Stroll The Alameda Wine & Beer Stroll. Grab your friends & neighbors and take a stroll along The Alameda to enjoy a variety of local wines & beers, entertainment, special offers at participating businesses and much more! Tickets purchased in advance are $25 per person. Your ticket includes 12 tastings, souvenir glass and an event map. Day of event tickets are $35. You must be 21 years or older to participate in the wine & beer stroll. To purchase tickets, please visit www.StrollTheAlameda.com. Do you love nature and numbers? Do you believe open space lands are essential to community health and wellbeing? If so, the Measure Q Expenditure Oversight Committee might be the perfect volunteer role for you! This seven-member committee provides public oversight for all funds collected and allocated by Measure Q. Each member contributes unique talents including an understanding of budgets and audit reports. Annually, the committee only meets up to four times to review: 1) the plan expenditures; 2) the annual audit and report prepared by an independent auditor; and 3) submits an annual oversight report. More information and the application can be found here: https://www.openspaceauthority.org/public-information/committees/measure-q-expenditure-oversight-committee.html#vacancies. The 2018-2019 school year begins this month. Please read these back to school safety tips from the Department of Transportation to achieve our City's Vision Zero goal. We have partnered with the AARP Fraud Watch Network to raise awareness about consumer fraud and identity theft and offer tips to our constituents on how to avoid becoming a victim of fraud. The summer months are prime time for home repair scams. The general ruse involves someone coming to your door and offering to do work on your home, typically at a big discount. AARP's Fraud Watch Network has prepared this video "Door-to-Door Home Repairs Scams", the first of a series we will be sharing with you, to illustrate several of the most common scams and to make it easier for you to share this information with your friends and family, so they too know what to look for to avoid becoming victims. San José has eased the rules for building an accessory dwelling unit (ADU), also called a granny unit or secondary unit. Lots as small as 3,000 square feet with a single-family home qualify. You can obtain a no-fee evaluation of your property and project idea from a City planner. Simply bring the ADU-Secondary Unit Review Worksheet to the Permit Center at City Hall (validated parking available). Visit www.sanjoseca.gov/ADUs for complete instructions. * What if my property is in a Planned Development Zoning District? * What are the rules for setbacks, height limits, and parking for my project? * What do I need to do to get a building permit? San Jose City College, a Brilliant Campus in our community offers 28 Non-Credit Classes for the Fall Semester, 22 ESL classes and 6 Bridge to Medical Careers; the classes are FREE. To register, contact Ana Rosa Camacho 408-918-5140 or ana.camacho@sjeccd.edu. Flash Fiction Forum's 5th anniversary reading, co-founded by a Willow Glen resident, will take place at Works Gallery downtown, 365 S. Market Wednesday, August 8th, 7:00-9:00 PM. Come hear 13 wonderful writers read their very short fiction in a convivial and creative community environment. Admission is free, but we request a $2 donation to the gallery, if you are able. Finalists of Technovation, the world's largest tech entrepreneurship competition for middle and high school girls will present their tech startup ideas on August 9th, 5:30-8:30 PM at the California Theatre, San Jose. Come to Avaya Stadium and watch Happy Feet, August 9th at 6:30 PM and Moana, August 16th at 6:30 PM on the big screen in the 7UP Epicenter, as part of the CEFCU Movie Night Series. Doors will open at 6 PM, and the movie will begin at 6:30 PM. Parking is free, while food and drinks can be purchased inside the stadium. Fans can bring blankets and chairs, but no outside food or beverages will be allowed. Commute traffic getting on your nerves? Don't resort to karate chops; come by the library and unwind with painting by the numbers! All materials provided. 100% free! For adults and seniors only. Call (408) 808-3077 to register. Must commit to all four sessions. Back to school is just around the corner. The Shop with a Cop Operation Backpack distribution event will be on Saturday, August 11th from 9:00 AM-11:30 AM at Santee Elementary School-1313 Audubon Dr. San Jose, CA 95122. August 22, 2018, 9 a.m. - 5 p.m. Please join us at the 8th Annual Silicon Valley Bike Summit, the region's largest gathering of active transportation leaders and organizers from government, the private sector, non-profits, and the general public. The Bike Summit will have breakout sessions on engineering protected bike lanes, equity and best practices for bike plans and public outreach, housing and transportation, grassroots advocacy, Safe Routes to School, Vision Zero, and more! $35 admission includes a light breakfast and lunch, plus post event social hour. Scholarships are available for those to whom the cost of admission is prohibitive; please contact emma@bikesiliconvalley.org to apply. Silicon Valley Pride are taking it to Plaza de Cesar Chavez Park in downtown San Jose. Join in the fun and festivities and celebrate our LGBTQ community and the Valley as Silicon Valley Pride celebrates its 43rd anniversary. Our theme this year is Unity. Diversity. Strength. The Stanford Blood Mobile will be at Good Karma Bikes on Saturday, August 25th. The mobile will be open 11:00 AM-3:00 PM. 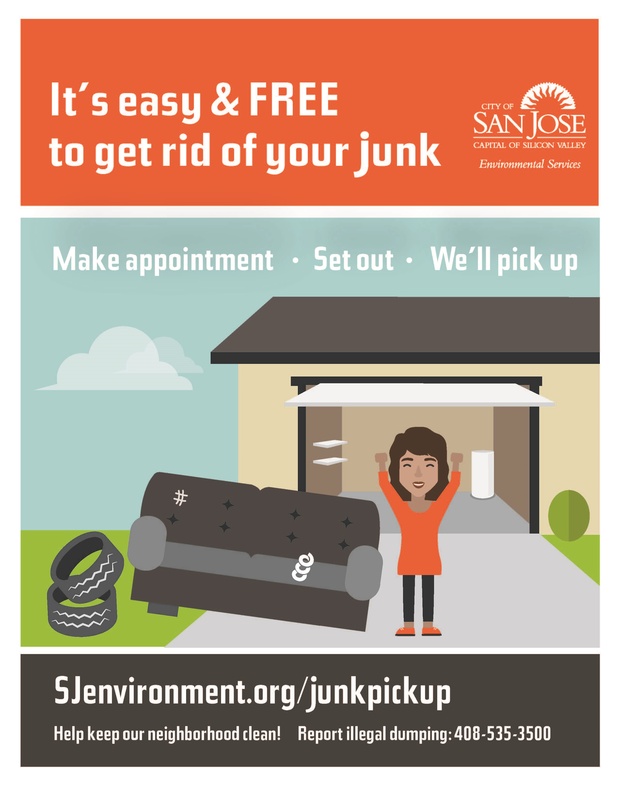 My San Jose - Your way to request City services! Want to get that pothole or street light fixed? Did you spot graffiti or illegal dumping that needs cleaning up? Perhaps you're wondering about how to report an abandoned vehicle or have a different City program to ask about. With the new My San Jose website or mobile app, it's now quick and easy to file and track a City service request or to reach one of our customer representatives. Learn more about the app at http://www.sanjoseca.gov/mysanjose. Come browse the Friends of the Bascom Library's Book Sale. All proceeds support programs at the Bascom Branch Library. Celebrate Willow Glen Branch Library's 10th Anniversary with special performers, crafts, a chance to talk to the Friends of the Willow Glen Library, light refreshments, and more! Light refreshments are funded by the Willow Glen Friends of the Library & Nothing Bundt Cakes - Willow Glen. Do a hovercraft-related activity, learn about the engineering design process and find out how to get involved with the Tech Challenge, presented by Dell! Ages 5 and up are welcome. For more information, call 1-408-794-6400 or visit www.hhpz.org. Residents in single-family homes can have large items (such as mattresses, sofas, refrigerators, tires, and more) picked up curbside by their recycling collection company. Each pickup includes up the three large items.